To you if you are a consumer purchaser of FLIC Luminaries. 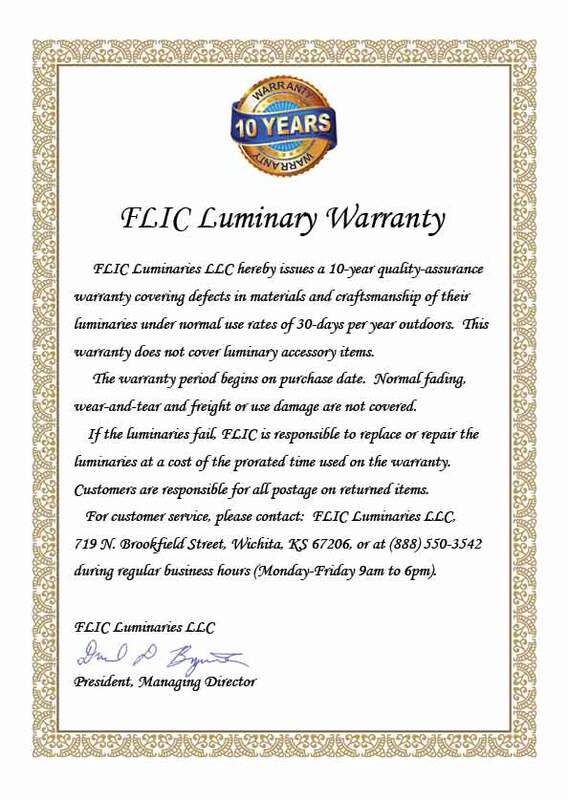 Under normal use and service (at a useage rate of 30-days per year), your FLIC Luminaries should be free from defects in workmanship and material for a period of ten (10) years from the date of purchase, EXCEPT FOR THE EXCLUSIONS, LIMITATIONS AND EXCEPTIONS SET FORTH BELOW. This warranty is for luminaries only and does not extend to lighting and other accessories for sale on this site. If the product fails, FLIC will either repair or replace the luminaries in question as your sole remedy. FLIC will exercise its judgment and shall have the sole option to select the best method to remedy the failure. You will be responsible for certain costs associated with the repair or replacement of FLIC Luminaries. Costs we do not accept include prepaid freight and postage costs for products returned to FLIC, and the prorated cost of time in use. This Warranty does not apply and FLIC has no responsibility for: (1) freight damage; (2) abuse, misuse, improper or abnormal use and storage of the product; (3) repairs, including replacement parts, not provided by FLIC; (4) product used for commercial or rental purposes; and (5) normal wear and tear from use. THIS WARRANTY EXCLUDES ALL CONSEQUENTIAL, INCIDENTAL, OR SPECIAL DAMAGES ARISING OUT OF THE USE OR PERFORMANCE OF THE PRODUCT INCLUDING BUT NOT LIMITED TO ECONOMIC LOSS, LOSS OF PROPERTY, LOSS OF REVENUES/PROFITS, LOSS OF ENJOYMENT OR LOSS ATTRIBUTABLE TO BREACH OF ANY WARRANTY MADE HEREIN. This Warranty extends ten (10) years from the date of purchase. Buyer and FLIC specifically agree that any controversy or claim arising out of this Warranty shall be settled by arbitration in the State of Kansas (as exclusive venue) administered by the American Arbitration Association under its Commercial Arbitration Rules. If the product fails, please notify FLIC LLC, 719 N. Brookfield Street, Wichita, Kansas 67206; phone 888-550-3542 during regular business hours (Monday-Friday 9 a.m. to 6 p.m. C.S.T.). Notification must be made within thirty (30) days of the discovery of the product failure. Upon receipt of such notification, FLIC will investigate the nature of the problem and perform its obligations as required herein.